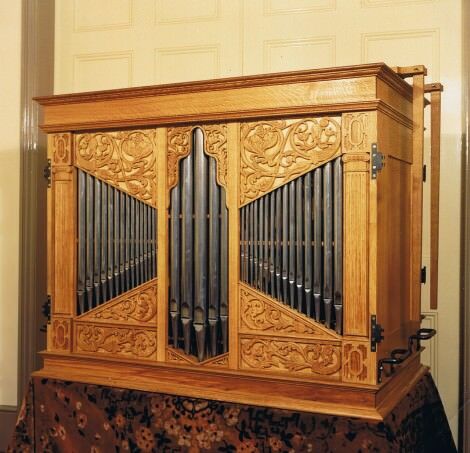 This organ is our opus 1, its design evolved with Trevor Jones, for whom it was made. The type of organ must have been quite common in England, with the organ sitting on a table and the bellows in the roof (like the 1630 Hunstanton Hall organ, which has its own stand). We based the layout on the Manderscheidt organ at Skara in Sweden, the front on the perspective designs of English early 17th century organs, and the sound on early English chamber organs. The regal is based on an example in the Brussels Musical Instrument Museum. The compass is C AA D – d³, dividing at c/c#. The pitch is a’=390Hz and can be transposed to a’=440Hz. The pipes are cone-tuned. The Diapason, Principal and Flute are made of oak, the upperwork of metal. The Regal has pear resonators with brass shallots. The voicing is soft to balance the viols, but the chorus is designed to give some presence to the solo organ music of the period. Hence also the provision of the low AA. The wind is supplied by two six-fold wedge bellows in the roof of the organ, operated by human hand. The organ now belongs to David Lawson, Director of Music at Monmouth School.